Product #45872 | SKU XPD-58GRND | 0.0 (no ratings yet) Thanks for your rating! The Hoya 58mm Graduated ND10 Filter is a graduated neutral density filter that helps to specifically darken skies and other bright areas of the image. The filter has a 3-stop density at one edge and evenly tapers to a 1-stop density at the opposite edge, with a smooth gradation throughout the middle of the filter plane. The design of this filter incorporates a rotating mount to allow precise positioning of the density over a selected area of the scene for greater control in darkening the brightest areas of an image. A neutral density filter does not affect the overall colouration of an image and helps to reduce the amount of light entering the camera lens in order to enable the use of wider aperture settings or longer shutter speeds. This filter is constructed from one wedge layer of clear optical glass that is matched and bonded to a second layer of neutral density filter glass for a smooth, even density transition that maintains high image quality. It is set within a durable rotating aluminium filter ring. 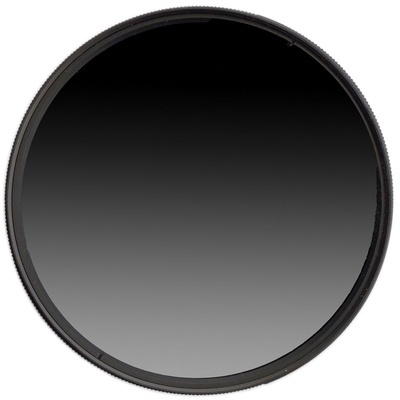 0.9 to 0.3 ND graduated filter for darkening skies and other bright areas of the image. Even density gradation across entire filter plane. Rotating mount enables controllable density placement. Neutral density filters do not alter the colouration of an image and help to reduce the amount of light entering the lens to permit an increased exposure. Clear optical glass construction with an aluminium filter ring.